^ astrology. Oxford Dictionary of English. Oxford University Press. [2015-12-11]. ^ astrology. Merriam-Webster Dictionary. Merriam-Webster Inc. [2015-12-11]. ^ Bunnin, Nicholas; Yu, Jiyuan. The Blackwell Dictionary of Western Philosophy. John Wiley & Sons. 2008: 57. ^ 5.0 5.1 Koch-Westenholz, Ulla. Mesopotamian astrology: an introduction to Babylonian and Assyrian celestial divination. Copenhagen: Museum Tusculanum Press. 1995: Foreword, 11. ISBN 978-87-7289-287-0. ^ 7.0 7.1 Kassell, Lauren. Stars, spirits, signs: towards a history of astrology 1100–1800. Studies in History and Philosophy of Science Part C: Studies in History and Philosophy of Biological and Biomedical Sciences. 5 May 2010, 41 (2): 67–69. doi:10.1016/j.shpsc.2010.04.001. ^ Vishveshwara, edited by S.K. Biswas, D.C.V. Mallik, C.V. Cosmic Perspectives: Essays Dedicated to the Memory of M.K.V. Bappu 1. publ. Cambridge, England: Cambridge University Press. 1989. ISBN 0-521-34354-2. ^ Peter D. Asquith (编). Proceedings of the Biennial Meeting of the Philosophy of Science Association, vol. 1. Dordrecht u.a. : Reidel u.a. 1978. ISBN 978-0-917586-05-7. Chapter 7: Science and Technology: Public Attitudes and Understanding. science and engineering indicators 2006. National Science Foundation. [2012-07-28]. （原始内容存档于2015-08-18）. About three-fourths of Americans hold at least one pseudoscientific belief; i.e., they believed in at least 1 of the 10 survey items"... " Those 10 items were extrasensory perception (ESP), that houses can be haunted, ghosts/that spirits of dead people can come back in certain places/situations, telepathy/communication between minds without using traditional senses, clairvoyance/the power of the mind to know the past and predict the future, astrology/that the position of the stars and planets can affect people's lives, that people can communicate mentally with someone who has died, witches, reincarnation/the rebirth of the soul in a new body after death, and channeling/allowing a "spirit-being" to temporarily assume control of a body. ^ Carlson, Shawn. A double-blind test of astrology (PDF). Nature. 1985, 318 (6045): 419–425. Bibcode:1985Natur.318..419C. doi:10.1038/318419a0. ^ Zarka, Philippe. Astronomy and astrology. Proceedings of the International Astronomical Union. 2011, 5 (S260): 420–425. doi:10.1017/S1743921311002602. ^ 12.0 12.1 David E. Pingree, Robert Andrew Gilbert. Astrology - Astrology in modern times. Encyclopædia Britannica. [2012-10-07]. ^ Thagard, Paul R. Why Astrology is a Pseudoscience (PDF). Proceedings of the Biennial Meeting of the Philosophy of Science Association (The University of Chicago Press). 1978, 1: 223–234. ^ Sven Ove Hansson, Edward N. Zalta. Science and Pseudo-Science. Stanford Encyclopedia of Philosophy. [2012-07-06]. ^ Astronomical Pseudo-Science: A Skeptic's Resource List. Astronomical Society of the Pacific. ^ Hartmann, P.; Reuter, M.; Nyborga, H. The relationship between date of birth and individual differences in personality and general intelligence: A large-scale study. Personality and Individual Differences. May 2006, 40 (7): 1349–1362. doi:10.1016/j.paid.2005.11.017. To optimise the chances of finding even remote relationships between date of birth and individual differences in personality and intelligence we further applied two different strategies. The first one was based on the common chronological concept of time (e.g. month of birth and season of birth). The second strategy was based on the (pseudo-scientific) concept of astrology (e.g. Sun Signs, The Elements, and astrological gender), as discussed in the book Astrology: Science or superstition? by Eysenck and Nias (1982). ^ Harper, Douglas. astrology. Online Etymology Dictionary. Retrieved 6 December 2011. 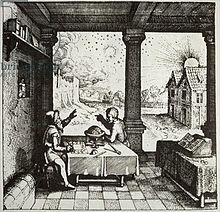 "Differentiation between astrology and astronomy began late 1400s and by 17c. this word was limited to "reading influences of the stars and their effects on human destiny."" ^ editor, Peter M.J. Stravinskas,. Our Sunday visitor's Catholic encyclopedia Rev. Huntington, Ind. : Our Sunday Visitor Pub. 1998: 111. ISBN 0-87973-669-0. ^ 22.0 22.1 Hess, Peter M.J.; Allen, Paul L. Catholicism and science 1st. Westport: Greenwood. 2007: 11. ISBN 978-0-313-33190-9. ^ Veenstra, J.R. Magic and Divination at the Courts of Burgundy and France: Text and Context of Laurens Pignon's "Contre les Devineurs" (1411). Brill. 1997: 184–185. ISBN 978-90-04-10925-4. ^ Saliba, George. A History of Arabic Astronomy: Planetary Theories During the Golden Age of Islam. New York University Press. 1994b: 60, 67–69. ISBN 0-8147-8023-7. ^ Catarina Belo, Catarina Carriço Marques de Moura Belo, Chance and determinism in Avicenna and Averroës, p. 228. Brill, 2007. ISBN 90-04-15587-2. ^ Catechism of the Catholic Church - Part 3. [8 July 2012]. ^ Jeffrey Bennett, Megan Donohue, Nicholas Schneider, Mark Voit (2007). The cosmic perspective (4th ed.). San Francisco, CA: Pearson/Addison-Wesley. pp. 82–84. ISBN 978-0-8053-9283-8. ^ Long, 2005. p. 173. ^ Long, 2005. pp. 173–174. ^ Long, 2005. p. 177. ^ Long, 2005. p. 174. ^ Long, 2005. p. 184. ^ Long, 2005. p. 186. ^ Hughes, Richard. Lament, Death, and Destiny. Peter Lang. 2004: 87. ^ Campion, Nicholas. History of western astrology. Volume II, The medieval and modern worlds. first. Continuum. 2009. ISBN 978-1-4411-8129-9. ^ 37.0 37.1 Marshack, Alexander. The roots of civilization : the cognitive beginnings of man's first art, symbol and notation Rev. and expanded. Moyer Bell. 1991. ISBN 978-1-55921-041-6. ^ Aveni, David H. Kelley, Eugene F. Milone. Exploring ancient skies an encyclopedic survey of archaeoastronomy Online. New York: Springer. 2005: 268. ISBN 978-0-387-95310-6. ^ From scroll A of the ruler Gudea of Lagash, I 17 – VI 13. O. Kaiser, Texte aus der Umwelt des Alten Testaments, Bd. 2, 1–3. Gütersloh, 1986–1991. Also quoted in A. Falkenstein, 'Wahrsagung in der sumerischen Überlieferung', La divination en Mésopotamie ancienne et dans les régions voisines. Paris, 1966. ^ 42.0 42.1 Rochberg-Halton, F. Elements of the Babylonian Contribution to Hellenistic Astrology. Journal of the American Oriental Society. 1988, 108 (1): 51–62. JSTOR 603245. doi:10.2307/603245. ^ Campion, 2008. p. 173. ^ Campion, 2008. p. 84. ^ Campion, 2008. pp. 173–174. ^ 46.0 46.1 Barton, 1994. p. 32. ^ Barton, 1994. p. 32–33. ^ Campion, 2008. pp. 227–228. ^ Parker, 1983. p. 16. ^ Juvenal, Satire 6: The Ways of Women (translated by G. G. Ramsay, 1918, retrieved 5 July 2012). ^ Barton, 1994. p. 43. ^ Barton, 1994. p. 63. ^ 53.0 53.1 Campion, 1982. p. 44. ^ Campion, 1982. p. 45. ^ 55.0 55.1 Campion, 1982. p. 46. ^ North, John David. The eastern origins of the Campanus (Prime Vertical) method. Evidence from al-Bīrūnī. Horoscopes and history. Warburg Institute. 1986: 175–176. ^ 57.0 57.1 Durling, Robert M. Dante's Christian Astrology. by Richard Kay. Review. Speculum. January 1997, 72 (1): 185–187. JSTOR 2865916. doi:10.2307/2865916. Dante's interest in astrology has only slowly been gaining the attention it deserves. In 1940 Rudolf Palgen published his pioneering eighty-page Dantes Sternglaube: Beiträge zur Erklärung des Paradiso, which concisely surveyed Dante's treatment of the planets and of the sphere of fixed stars; he demonstrated that it is governed by the astrological concept of the "children of the planets" (in each sphere the pilgrim meets souls whose lives reflected the dominant influence of that planet) and that in countless details the imagery of the Paradiso is derived from the astrological tradition. ... Like Palgen, he [Kay] argues (again, in more detail) that Dante adapted traditional astrological views to his own Christian ones; he finds this process intensified in the upper heavens. ^ Campion, 1982. p. 47. ^ Rabin, Sheila J. Pico and the historiography of Renaissance astrology. Explorations in Renaissance Culture. 2010 [10 February 2016]. ^ Harkness, Deborah E. The Jewel House. Elizabethan London and the Scientific Revolution. Yale University Press. 2007: 105. ISBN 978-0-300-14316-4. ^ Harkness, Deborah E. The Jewel House. Elizabethan London and the Scientific Revolution. Yale University Press. 2007: 133. ISBN 978-0-300-14316-4. ^ 64.0 64.1 64.2 64.3 Flood, Gavin. Yano, Michio. 2003. The Blackwell Companion to Hinduism. Malden: Blackwell. ^ Richard Dawkins. The Real Romance in the Stars. London: The Independent, December 1995. 31 December 1995. . See also Astronomical Pseudo-Science: A Skeptic's Resource List. Astronomical Society of the Pacific. ^ Eysenck, H.J., and Nias, D.K.B. (1982) pp.42–48. ^ The Humanist, volume 35, no.5 (September/October 1975); pp. 4–6. The statement is reproduced in 'The Strange Case of Astrology' by Paul Feyerabend, published in Grim (1990) pp.19–23. ^ British Physicist Debunks Astrology in Indian Lecture. Associated Press.